In this video, you will see how Macy and her baby Loca were found reckless in a field. These two poor animals were exhausted, starving, and freezing. You can see Macy is lying down, resting her head on the snow and shivering irrepressibly. It’s really upsetting to see how the two suffered in the cold, but what makes me happy is the fact that the two were eventually saved from the unbearable situation. I really appreciate the efforts that were made up by the World horse Welfare group. They just showed up at the right time. The two were later taken to the UK Rehoming Center to go on with their rehabilitation and lifesaving treatment. 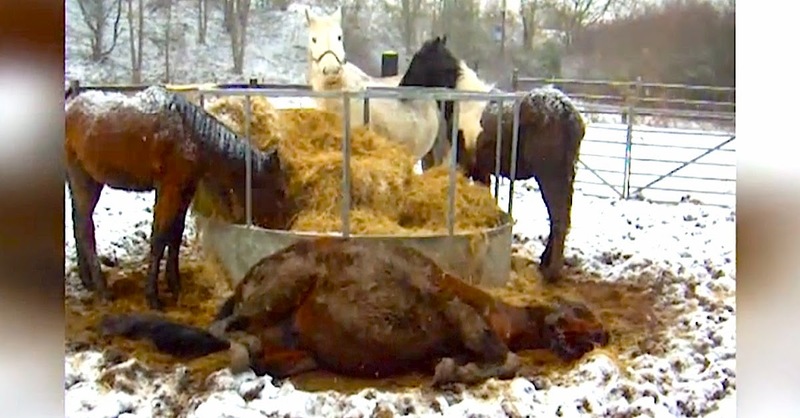 This incident reminds me of the neglected horses in Tennessee, where the residents and the sheriff’s department came together to help the suffering horses. The vets suggested that Macy could not have made it if the rescuers would have delayed further. Surprisingly, the brave mother stood and embraced the care she was being offered. It’s really touching to see people come to the aid of animals. Watch this clip to see how everything happened.